The galvanized building wire mesh welding machine adopts synchronous control technology. The sub-control welding and welding time are controlled by PLC digital programming system. The input interface is composed of touch screen and buttons, and the operation is more intelligent and rational. The welding transformer adopts a highly efficient and controllable multi-stage transformer to expand the range of welding wire diameter and expand the scope of use of the machine. The galvanized building wire mesh welding machine adopts synchronous control technology. The welding time and sub-control welding are composed of PLC digital editing system. The input panel is touch screen or button, and the operation is more intelligent and rationalized. With one compression and split welding, the controller has the advantage that different sizes of holes between the weft and the weft can occur on the same web. The welding uses a new type of high-efficiency welding transformer, which can be divided into eight grades, which expands the range of welding wire diameter. Easy to operate and flexible, it is several times the output of a manual spot welder. Excellent independent design ability and fast after-sales service guarantee are the cornerstone of every customer's trust. We believe that our efforts will bring better benefits to each customer. 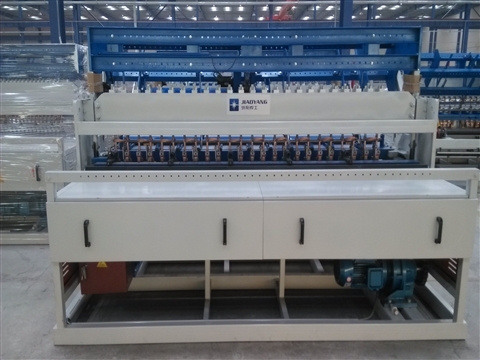 The galvanized building wire mesh welding machine mainly includes: wire storage disk storage, straightener, welding host, turntable funnel part, CNC drawing part, automatic cutting machine, automatic falling film, output car and other functions. The main production features: fast welding speed, saving time, high output, saving 1-2 people enough, the flatness of the product is good, the efficiency of the whole machine is high.